All these offers are expired. For the top current offers, click here. There are five credit cards right now with limited time sign up bonuses between 50,000 and 80,000 points. 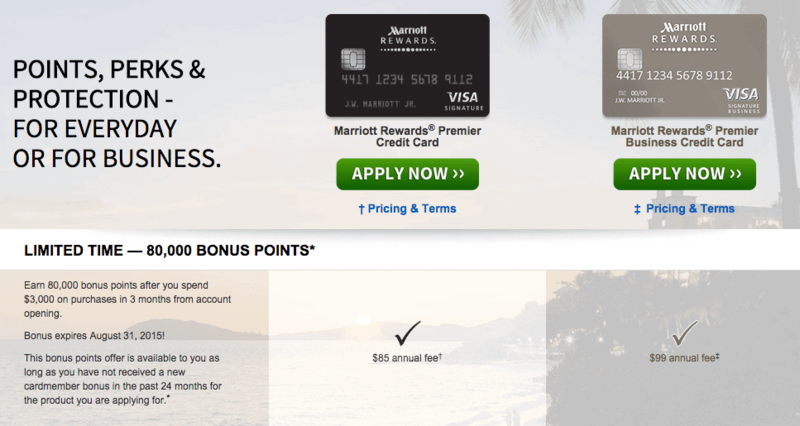 The Chase Marriott (personal and business versions) cards offer 80,000 bonus points after spending $3,000 in the first three months and paying an $85 or $99 annual fee. These offers have been around since July 7, and there is a stated end date of August 31, 2015. The normal offers have been 50,000 points after spending $1,000 in three months or 70,000 points after spending $2,000 in three months. Both those offers have the first year annual fee waived, so the difference in the limited time offer is more points for higher spending and payment of an annual fee. This offer has been around since July 2, and it has no stated end date. This offer began July 7 and has no stated end date. The last limited time offer on the card, for only 50,000 bonus points, lasted about three weeks. The “normal” offer had been 30,000 bonus points, so the new offer gets you 20,000 more bonus points. Not that this card is even primarily about bonus points. My FAQ of the Citi Prestige Card explains its many benefits like $250 in airfare or airline fee credits per calendar year, access to the American Airlines Admirals Clubs and Priority Pass lounges, 3x points per dollar on air travel and hotels, and a $450 annual fee. ThankYou Points can transfer to 11 airlines or be used like cash to book any flight. Mid-2015 has been a gold mine of improved credit card offers. Many are limited time offers with no listed end date, which makes planning a challenge. Don’t miss out on the offer that appeals to you. Get these 50,000 to 80,000 point cards before they disappear. Two hotel cards in 2 days (link) and 5 RTs air already so I’m set . The Marriott doesn’t care in KONA Hi cheap room or GREAT room same points like a $75 difference in cash price . Now with my Hotel/com Freebies 7 free nites there . Let’s hope the sharks are hungry . May the UBER be with you !! not sure i understand the “…and their end dates” in the title – 4 out of 5 you say you don’t know the end date.